Otis Darnell began his career with Mesa County Public Works on June 26, 1978, as a Tech 1 in the traffic division and within six months was promoted to Tech 3. A sign he was about to embark on a journey of accomplishments through hard work and dedication. Throughout Otis' career with Mesa County, he continued to advance while demonstrating leadership and perseverance. He continued to climb the ladder and was promoted a few times, before advancing to District Manager for District B in 1993, a position he has held for 24 years. 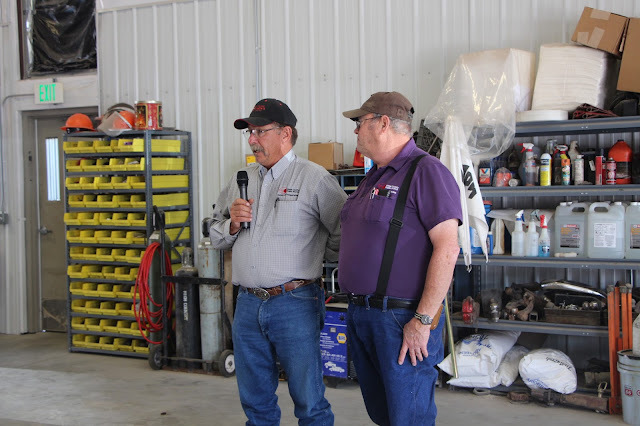 During his 39-year tenure, Otis Darnell has served the community with dedication and an unwavering commitment to provide and maintain safe and efficient roads for the residents of Mesa County. His principles and dedication have played a critical role in providing road services at all hours and in all types of weather conditions to safeguard the community. The Mesa County Commissioners honor Otis Darnell for his 39 years of dedication and exemplary service to the residents of Mesa County and extend their sincere best wishes for success in all his future endeavors. Mesa County Commissioners present Mesa County Road and Bridge Maintenance District Manager Otis Darnell with a proclamation that recognizes his many years of service to the residents of Mesa County. From left, Scott McInnis, Otis Darnell, John Justman, Rose Pugliese. Mesa County Road and Bridge Maintenance District Manager Otis Darnell has worked for Mesa County for 39 years. The Mesa County Commissioners congratulate Otis on his accomplishments and tenure. Mesa County Commissioners celebrate Otis Darnell alongside his wife and grandson. Mesa County Road and Bridge staff congratulate Otis Darnell on his retirement. Mesa County Road and Bridge Maintenance District Manager Otis Darnell has worked for Mesa County for 39 years. His dedication and exemplary service to the residents of Mesa County are invaluable.